Another one completed from my 101 list. I just love crossing things off! For the month of February, I didn't eat any fast food. If there was a drive through, it was off limits. Doesn't sound like a big deal, but it was a bad habit. When is comes to french fries, I do not have any will power. Eating fast food a couple times a week isn't healthy and I really needed to make myself accountable and stick with this. Granted it was the shorteest month of the year, but it still counts. And of course, its not a real post without a photo. 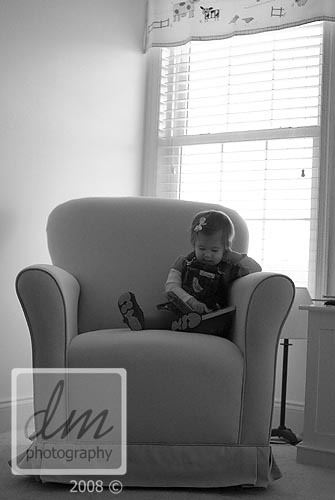 So here is my Gracie...looking so grown up, sitting in her chair, reading a book...all by herself. What an adorable picture! And I know what you mean about french fries...I'm the same way. I gave up eating fried foods for Lent, and I already feel about 100% better!